How To Have A Depression Free Life? Treating depression can be important and a difficult time in your life. You have to research your condition and ask for the right kind of help, so you can get better. Keep in mind that you are not the only one battling this illness. Here are some tips to help you start understanding it, help you start taking control of it, and help you to start seeking treatment for it. When you are feeling blue, turn up the noise and start dancing. Use some fast-paced music that can help you get moving. How many people can feel blue when dancing to the beat of their favourite tunes? Not that many! Select songs that you like and that will make you feel good. Catch up with some friends and family and just hang out and relax, or watch a movie with a bucket of popcorn. Getting out and enjoying a relaxing social event may improve your mood. If you are troubled by depression, transform the thoughts that run through your mind over and over again. Instead of allowing negative words to control your thoughts, change the things you say to yourself into positive statements, even if they feel silly at first. By telling yourself positive things over and over, your mind will come to believe them. By exercising, you are producing endorphins in the brain. These endorphins are feeling good mood boosters. If you are feeling sad, start moving and get a little exercise. The more energetic and fast-paced, the better off you are. Endorphins are neurotransmitters that act as the body’s natural pain killer and are known to induce positive feelings and euphoria. Vitamins and minerals are essential for fighting depression. In particular, vitamin B12 is very helpful. Vitamin B12 gives you a nice boost of energy. It is readily available as a supplement. You should use the supplement instead of consuming red meat that has it. The high calorie and fat content of meats can have a negative impact on your health. To get rid of a little bit of depression look into doing a new hobby and you can also try getting into an old one. If you aren’t sure what to do, try volunteer work within your community. It will also help you feel better about yourself. Try to work on one or two problems at a time, and take small steps to make them go away. Working on too many problems can have a negative effect on your mind, and worsen symptoms of depression. Banish the words “depressed” and “depression”. Labelling yourself with a vocabulary that specifies depression will exacerbate the stigma attached to them. Try thinking of your state of mind as being “a bit low” or “not quite positive” instead. It’s not as difficult to think about changing your mood as it is to conquer “depression” even though the two things are really the same. Try to laugh next time you feel sad. Even if you have to fake it, just give it a try. Laughter really is the best medicine, as there is a strong connection between laughing and calming endorphins being released by your body. Try laughing with friends, watching a comedy show, or seeing a funny movie. Once you start laughing, your depression may well melt away. Let your doctor know if your depression makes dealing with everyday life too difficult. 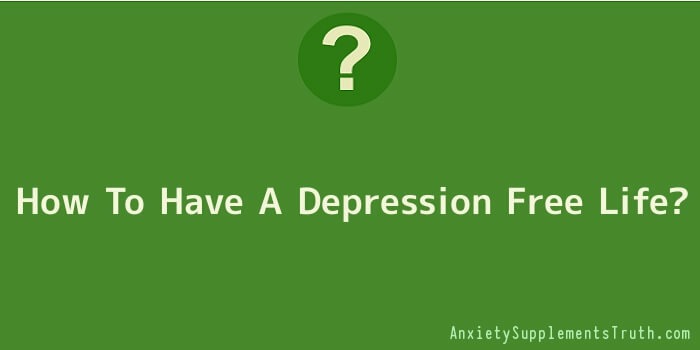 Even your regular doctor can recognize the symptoms of depression and recommend a specialist. Seeing a therapist is something that a lot of people dread, but you may need to start taking antidepressants and receiving therapy to help with your depression. It can be hard work to learn how to treat your depression and may require quite a bit of conscious effort, yet it is also rewarding. Regardless of the effort you have to put in, if you’re willing to stay on plan depression can be beat. Learn all you can ask for help and use the tips provided, and you can see success in your depression battle.